General Properties of Molasses, including (Heating Molasses). Molasses is a thick syrup weighing approximately 1.45 kg per litre (90 lbs per cubic foot). It can be stored for long periods without deterioration providing dilution does not occur. If dilution does occur molasses is liable to ferment fairly quickly. Storage tanks therefore must be constructed so that water cannot get in, and in addition tanks should be vented to prevent condensation taking place and diluting the surface of the molasses. An adequate system of ventilation also helps to prevent steel tanks from rusting. The most frequent description given to molasses is that it is viscous but too much emphasis need not be placed on this property since a well-designed system incorporating a simple heating device will enable molasses to be handled satisfactorily. As the temperature of molasses is raised viscosity falls, and an increase of 5.6oC (10oF) will approximately halve the viscosity. For handling molasses within a feed mill for example, a temperature of 32o-38oC (90o-100oF) will not only greatly reduce the viscosity but the variations between molasses from different sources will also tend to be far less. Molasses should not be heated over 40.5oC (105oF) since above this temperature destruction of sugars will occur and its feeding value will be damaged. Molasses may caramelise at about 49oC (120oF). Normally molasses is quite safe to handle, but if water has entered the tank fermentation may have taken place with the generation of carbon dioxide gas, which is asphyxiating and alcohol vapour, which is flammable. Therefore if this is thought to have taken place the tank should be thoroughly ventilated before entering it and any residue should be thoroughly cleaned out before any hot work such as welding is done on the tank. Heat Authority specializes in heating totes and tanks for the food and feed industries. 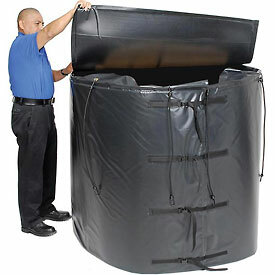 IBC totes ranging in size from 220 – 550 Gallon and above, can be heated using a patented heat spreading technology called GreenHeat to evenly distribute the heat to the entire blanket surface. Heat Authority carry heaters from several different manufacturers, all with varying specs and options (120 vs 240 volt, top covers, adjustable thermostat controllers, etc). Prices range from about $1300 to $1600 dollars depending on what option you need. Contact HEAT AUTHORITY by calling (866) 805-HEAT. Also available in larger and smaller versions. Powerblanket, ProMAX and BriskHeat models in stock. Also available for DEF (Diesel Exhaust Fluid) Powerblanket pumping stations and other tote tank configurations.